ATP has formulated the highest quality combination of glutamine and glycine on the market. 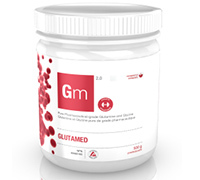 Glutamine is the primary fuel source for the cells of the intestinal mucosa, while glycine helps convert glucose into energy. L-Glutamine and L-Glycine helps support the health of the immune and digestive systems after periods of physical stress. L-Glutamine also assists in muscle cell repair after exercise. No additional ingredients not listed on the label have been added to the product. This product does not contain wheat, gluten, corn, nuts, dairy, soy, eggs, fish, shellfish or animal by-products. Recommended dose: Take 5 grams (approx. one teaspoon) in water per day without food, or as directed by a qualified health practioner. Pregnant or breastfeeding: Consult a health care practitioner prior to use.